Where every critter is a Friend of Bill! Check our Reviews on Yelp.com! Bill and I met in the summer of 2000 when I was doing some softball umpiring for a local league. One of the teams was sponsored by a construction company, and Bill, his sisters and his Mom were found living on a site. I had lost my last dog a few years earlier and still felt the loss. I had NO intention of getting another dog at that point and emphasized that to the players who asked me if I wanted a puppy. So they brought me a huge TV packing box with this tiny black & tan puppy in it. Game over, I was hooked. Bill and I have been through years of training together and he is now an Official AKC Canine Good Citizen. Thanks for looking us up, and please give us a call today! On October 28, 2015, Bill crossed the Rainbow Bridge to play with all the buddies who went on ahead. We will miss him every day. So long, old friend. Ed has cared for pets since he was a child. He had turtles, gerbils and hamsters of his own and cared for the family cats and dogs. Later on he worked for the family kennel raising and training Newfoundland dogs for show and obedience. The current zoo now includes the dog, Reno; our house cats Freya and Maia; a Leopard Gecko, Rajah; a couple of Madagascar Plated Lizards named Doctor Lizardo and Penney Pretty, and a Crested Gecko with no name. He managed the San Ramon location for Pet Food Express, the finest pet food company in the nation, where he was introduced to a wide range of exciting new food, health and grooming products for today's pampered pets. 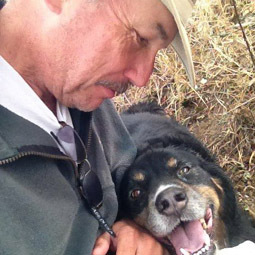 He is a certified canine behavior consultant, graduating from from the Marin Humane Society's Consultant Instructor Training Academy in February of 2005. Ed also apprenticed for two years as an assistant trainer for Bring Rover Over, a superior canine training facility in Martinez, CA. This gave him the practical experience necessary to help you solve your doggie behavior issues and training questions.